Nursing is integral to meeting the growing demand for palliative care which is being driven by population aging and the increasing burden of chronic, noncommunicable disease. Palliative nursing and nursing in general share many of the same principles and practices. Both are committed to addressing the holistic domains of health (physical, psychological, emotional, cultural, social, practical, spiritual, and informational aspects of a person’s health and well-being) (Fitch, Hosp Q 3(4):39–46, 1999). 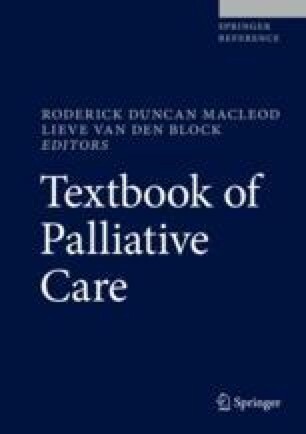 This chapter provides an overview of the role of nursing in the context of contemporary interdisciplinary specialist and primary palliative care, key constructs underpinning palliative nursing, the core competencies of specialist and primary palliative care nursing, and how these competencies can be applied to provide best evidence-based person-centered palliative care, regardless of the care setting. Aranda S, Yates P. A National Professional Development Framework for Cancer Nursing Canberra: Cancer Australia. 2009. 2nd:Available from: http://edcan.org.au/assets/edcan/files/docs/EdCanWeb_2nded.pdf. Caresearch. Euthanasia 2017. 12 Apr 2017. Available from: https://www.caresearch.com.au/caresearch/tabid/1545/Default.aspx. Picker Institute Europe. Principles of patient centred care 2017. Available from: http://www.picker.org/about-us/principles-of-patient-centred-care/. World Health Organisation. WHO definition of palliative care 2003. Available from: http://www.who.int/cancer/palliative/definition/en/.